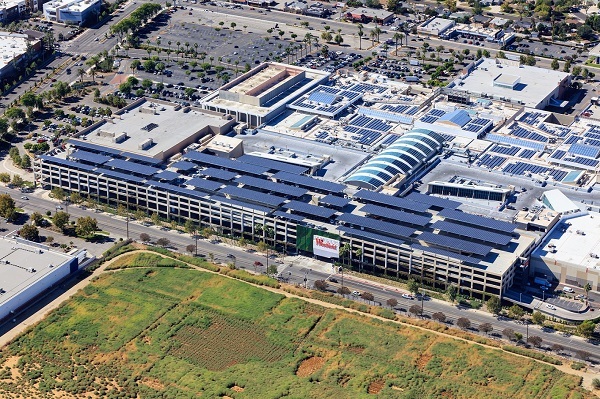 A birds-eye-view of Safari Energy's 3,387 kilowatt capacity solar project at the Westfield Topanga & The Village in San Fernando Valley, California. Safari Energy, the leading commercial and industrial solar developer, today celebrated its role in the completion of a 3,387 kilowatt capacity solar development at the Westfield Topanga & The Village in California’s San Fernando Valley; a project in which it managed the overall system design, permitting, and construction. With the completion of the Westfield Topanga & The Village solar array, Safari Energy has partnered on more than a dozen commercial and industrial solar deals in California with leading real estate investment trusts (REITs). It also represents the 20th commercial-scale parking deck or canopy project Safari Energy has completed from Hawaii to Massachusetts, with several more in development. “Together with contractors like Safari Energy, Westfield Topanga & The Village is able to address the sustainability goals of our property, and provide our communities with a destination that is greener and speaks to the aspiration of the broader San Fernando Valley community,” said Molly Unger, Vice President and General Manager of Westfield Topanga. Encompassing more than 360 stores, restaurants, gyms, and entertainment venues , the San Fernando Valley's leading destination is also one of the ‘greenest’ in the US. By 2019, the center will already have achieved an impressive 30% reduction in electric energy consumption through solar and other initiatives. Safari Energy supports clients such as Westfield Topanga & The Village in achieving green goals, some of which have earned prestigious recognition by organizations including NAREIT, the U.S. Department of Energy and GRESB. The San Fernando Valley’s fashionable front door for real-life, luxury, and influencer designer brands, Westfield Topanga & The Village combine to provide a dual destination experience unlike any other in the local community or wider region. For pure power shopping bliss in a cool and elegant indoor escape, Westfield Topanga’s one-of-a-kind lineup comprises Neiman Marcus, Nordstrom, Macy’s, Target, Tesla, Apple, Microsoft, and Anthropologie – as well as an ultimate luxury collection featuring Tiffany & Co., Gucci, Salvatore Ferragamo, Louis Vuitton, Cartier, Burberry, Tory Burch, David Yurman and many more world-class brands. Directly across the street, The Village provides the open-air social setting so long craved by Valley residents – together with a stylishly designed Costco, eclectic shops, highly-rated health and wellness amenities, as well as chef-led restaurants with beautifully landscaped al fresco patios. Combined, the nearly 350 shops, restaurants, and personal service providers located at Westfield Topanga & The Village generate annual retail sales well in excess of $1 billion – making this one of the most significant and productive retail destinations in the entire nation.